» Mr. Griffin III Goes to Washington? 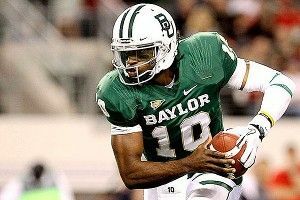 Back in November, when Robert Griffin III insisted he was keeping all of his options open, he sat in a windowless conference room and told me he was seriously considering a return to Baylor for his senior season so he could enroll in law school, and that he had not ruled out the possibility of making a go at the 2012 Olympic Games as a hurdler. All these possibilities laid out before him seemed to brighten his spirits, and yet when I asked specifically about the NFL, pragmatism crept in. Griffin is one of the most exciting college quarterbacks I’ve ever watched, and he is also one of the most self-aware and charismatic and intelligent football players I’ve ever spent time around, which is why he’s capable of telling hard truths about professional football without coming across as bitter or spiteful. Everything he said about the NFL is true, of course, and no team has made more of a spectacle of itself over the past dozen years than Dan Snyder’s Washington Redskins. This weekend, Snyder and coach Mike Shanahan gave away three years’ worth of first-round draft picks, a second-round pick, a lifetime supply of Johnny Rockets Smoke House Doubles, and a tannis-root necklace for a chance to move up to no. 2 in the draft and (presumably) choose the quarterback known as RG3. It is a serious parlay, and I’m sure no one is more cognizant of the risks involved than Griffin himself. It is possible, of course, that Griffin will be a failure in Washington. I think he’s got the diverse skills required to be a great quarterback, and I know he’s got the cerebrum to be a great quarterback, but sometimes these things just don’t happen. And yet even if that happens, I can’t imagine Griffin getting blamed for it. In a way, he is in the perfect position, coming to Washington amid these elevated stakes, because no matter what he does he will always hold the high ground. Griffin is charming, a descriptor that does not apply to either Shanahan, his squinty coach-to-be, or Snyder, the reviled Redskins owner, both of whom now need Griffin to succeed in the NFL more than Griffin himself needs it. Griffin was a political science major in college, and while he demurred when I asked him about his political aspirations, his Baylor teammates referred to him as The Ambassador. It would not surprise me if he is a United States senator at age 40, if he wants to be, and so Washington may be the perfect place for him to measure his ambitions. He struck me, in the brief amount of time I spent with him, as someone for whom football could become a means to an end, and if he projects that demeanor during his time in D.C., he will rise above any struggles he may endure, and he will rise above the peccadilloes of his coach and the ineptitude of the man who pays his salary. I don’t know if he can play in the NFL, but I believe Robert Griffin can play the other game inherent to Washington culture, and this may make him a great success, even if he is a failure.